They are fascinating creatures, but even more so when they’re this tiny. He was only about 1/2 to 3/4″ long and bright green in color with no markings yet. They really hop around a lot when they’re this small too, bouncing from one flower to another. Thanks for sharing the great photo. I have always thought praying mantis are cute when small in size, but the large ones are a tad intimidating in looks and actions! 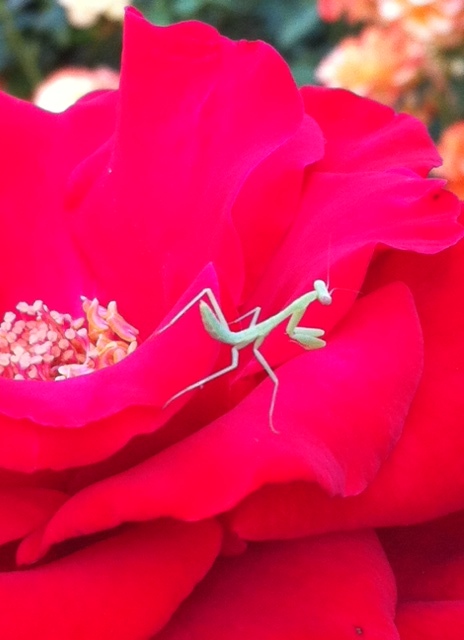 I realize they are friends of the gardeners and plants, so I like them anyway and find them so interesting to watch. They appear almost “alien” like!